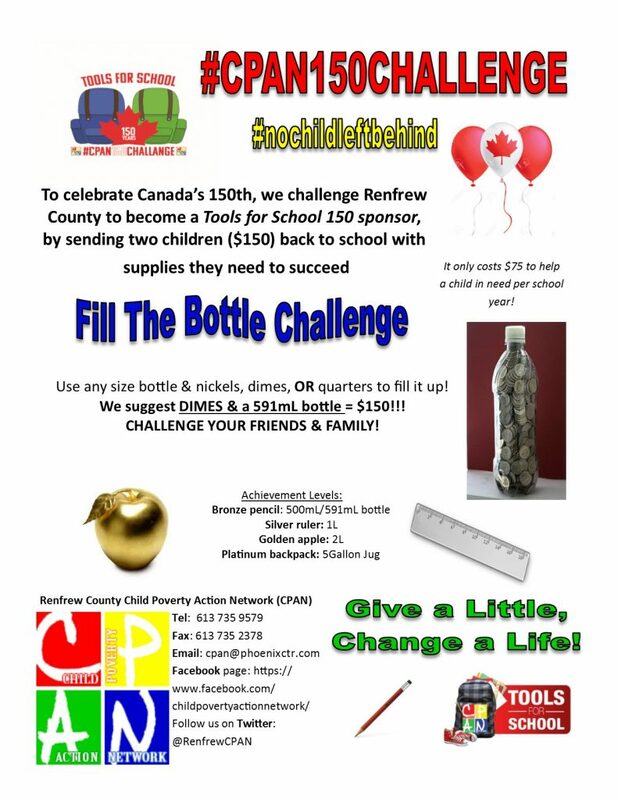 CPAN helps between 1,000 and 1,500 Renfrew County children and youth who are in need with Backpacks, school supplies, and shoes, enabling them to return to school fully prepared to learn. Research has consistently shown that children that have the tools to learn are less likely to drop out, and more likely to graduate and transition to post-secondary education. We need $75,000 per year to fund Tools for School. Currently we have raised $30,000, and need to make up the shortfall. To help boost this funding CPAN created an initiative called the CPAN 150 Challenge. This initiative will help raise awareness of the need, and benefits, of Tools for School. The challenge will also help us reach our goal so that no child is left behind – by encouraging others to raise funds in creative and fun ways. To honour and celebrate Canada’s 150th birthday, while also recognizing our (Canada and CPAN) shared interest of inclusion and diversity CPAN is challenging individuals, groups, businesses, organizations, etc. to raise $150 for Tools for School, enough to sponsor 2 local children in need. Taking the challenge is easy! Share with CPAN – we can share on our Facebook Pages! To support Tools for School and this initiative a short video has been created. Thanks to the generous donation of time and skills by 7-year-old local actress Jadyn Malone, who starred in the blockbuster movie ‘Arrival’, and Lotus City Media this video became a reality. Please take a minute to watch it, and feel free to share the following link with your family and friends: https://www.facebook.com/cpan150challenge/videos/1323703964392119 We believe that it speaks volumes about the importance of this very worthy and well-used and needed program, Tools for School.